Triangle Cross Ranch is a year-round program and can accept new students at any time. Acceptance is based on a combination of a review of the student’s current and past history of behavior, and consultation with the student’s parents or sponsor. Triangle Cross Ranch helps struggling teenage boys (ages 10-17) become successful by teaching the values and skills necessary to be successful in the real world. We serve 10-17-year-old boys who have a history of mild to moderate emotional and behavioral problems, low self-esteem, defiance, academic underachievement, substance abuse issues, and/or family conflict. First, you’ll need to help us determine if your son will be a good fit for the types of young men we work with at Triangle Cross Ranch. You can do this by reading over our student profile completing a quick online admission interview form. After you’ve determined that your son will be a good fit for Triangle Cross Ranch, you’ll need to speak with an admissions counselor (call 307-213-7116) to help confirm your decision and answer any questions you may have. We will also help evaluate whether or not your insurance will cover any of your treatment costs and offer financing suggestions if needed, so that you can gauge your monthly out-of-pocket expenses for treatment. If desired you may also set up a ranch tour with your admissions counselor. Your admissions counselor will get you an enrollment packet which you’ll need to complete and return. At this point, you can also arrange for your son’s transportation to Triangle Cross Ranch. Parents are welcome to travel to Triangle Cross Ranch with their son, we do not recommend that your son flies to the Yellowstone Regional Airport by himself, thus we can help you make arrangements for transport with our transportation service for an additional fee. Once your son arrives at Triangle Cross Ranch we ensure that all enrollment details are complete and we will arrange for an educational and therapeutic evaluation. To speak with an admissions counselor (call 307-213-7116) They will be happy to answer any of your questions. As a Catholic Christian Therapeutic Residential Substance Abuse Treatment Program Triangle Cross Ranch offers a temporary home to troubled teen boys who are struggling. 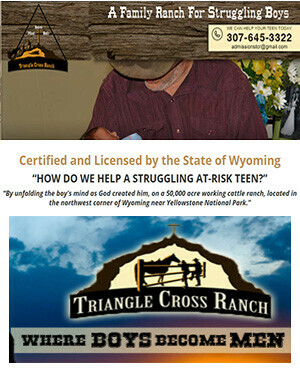 If your child has begun to display some of the characteristics that struggling teens often show, contact us immediately to see if Triangle Cross Ranch Residential Youth Ranch Program can benefit your son. Please call and we will help you find the right place for your child, our number is 307-213-7116.